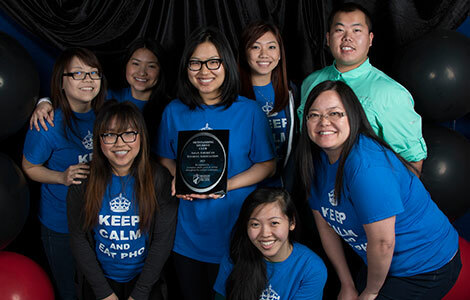 The Outstanding Student Club of the Year was the Asian American Student Association. As she opened the annual Celebration of Student Success Awards Banquet, Executive Leadership Team member Jessica Keophilavanh introduced the theme of this year’s celebration. Student clubs and groups, student leaders, club advisors and college instructors were honored at the ceremony. There were 113 students, 20 advisors and 35 student groups nominated for awards. More than 330 people attended the banquet. Five students were presented with the Karen Roberts Student Life Leadership Award. The award is the highest honor presented to a Madison College student leader and included an award of $200 for each recipient. The recipients were Angeline Mboutngam, Isaac Brown, Sarad Aryal, Christina Thao and Jessica Keophilavanh. Mboutngam has been a mentor in the TRiO program for two years and tutors students in French. She has been an officer for the Executive Leadership Team and for Phi Theta Kappa. Brown currently serves as the Student Senate president and as co-chair of the Student Activities Board. He is also a highly involved member of the Horticulture Club and The Clarion. Aryal is the president of the Volunteer Center Board and vice president of public relations for the Student Senate. This is his second year with the Volunteer Center and he has helped coordinate and run a wide variety of service events at the college. Thao is a member of the Asian American Student Association and helped organize a Hmong class the group sponsored during the fall semester. She also has helped promote higher education among youth at the college’s Asian Youth College and Career Fair. Keophilavanh is the vice president of marketing for the Executive Leadership Team. She has served as the secretary of the Veterans Club, is a member of the Volunteer Center and has written several articles for The Clarion over the past two years. The Outstanding Student Club of the Year was the Asian American Student Association. The club held a variety of activities this past school year. It hosted Hmong language classes, promoted Madison College at the city’s Hmong New Year celebration, coordinated a bone marrow donor campaign, hosted a Chinese New Year celebration and co-sponsored the Global Showcase. The Outstanding Student Organization of the Year was the Beta Beta Psi Chapter of the Phi Theta Kappa Honor Society. The group increased its membership by 55 percent this year, hosted scholarship workshops at four difference campuses in the district, and had 12 members receive the highest level of recognition from the honor society. Devi Bhargava Student Award – Evan Halpop.